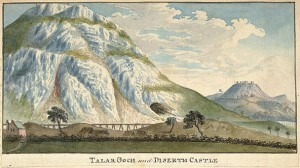 A watercolour illustration by Moses Griffiths for Pennant's 'Tours of Wales' of 1784. Only one working is shown on the lower slopes of Graig Fawr. In the foreground can be seen some details of the mine centre: a launder for the watercourse and some tent-like structures, possible covering the entrances of small shafts. (The National Library of Wales). This mine has a very interesting history, being probably the oldest in the country. It was, according to local tradition, opened by the Romans, and has been worked ever since. It had once been considered the richest lead mine in Wales. Mine levels and spoil heaps, many now obscured by vegetation, provide evidence of a history of mining activity in the locality where lead and zinc were mined extensively. 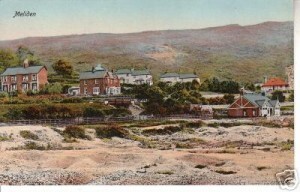 Cae Llys dressing floors (where the Old Peoples housing is today). The waste (or smyddan) on the dressing floors are conspicuous. Rich mineral intrusions occurred in the limestone around Graig Fawr. These veins ran predominantly from south west to north east and were mined extensively. The Talargoch mines were probably first dug by the Romans to extract silver or possibly lead. Silver continued to be mined during the Middle Ages and up to the mid-18th century when lead and zinc extraction became more profitable. Talargoch was one of the most important lead mines in the area, reaching its peak in the 1850s. Talargoch ca. 1900: This is the nearest to a photograph of the mine in its working heyday. The view looks north-east from a point near the 80 inch Engine Shaft. On the left is the 80 inch Engine House; in the centre is the No.1 Engine House and its chimney with the roof of the mine office between them; to the right are the mine stables and Talargoch Cottages. (Clwyd Record Office). At least ten shafts were sunk around Meliden, all connected underground by horizontal ‘levels’ following the ore veins. The main shaft was over 330m deep, but with the sea so near and the mine’s low lying position, water seeping through the porous limestone became a major problem. The engine house at the Clive Shaft was built in the 1860s to house a massive steam engine for pumping water from the southern end of the mine workings. It is still visible today, adjacent to the Dyserth Falls Resort (formerly Graig Park Hotel & Country Club). Unfortunately, the increasing costs of keeping the mine dry meant that the company was unable to compete against cheap imported ores, so in 1884 the mine closed. The development of the mines and quarries was the main reason behind the growth of the villages of Meliden and Dyserth. The former Prestatyn-Dyserth railway line, along which a recreational footpath now runs, was originally built to serve the two industries. The opening of the railway in 1869 made transporting the ore far easier than the previous method of shipping it from the tiny ports of Rhuddlan or Prestatyn. The Clive Engine House was constructed as part of the Talargoch Lead Mine, which occupied an extensive area extending north to Meliden. It is thought likely that lead was worked in this area from the prehistoric period and several Roman artefacts have also been discovered. These early workings are most likely to have exploited shallow outcrops on Graig Fawr and deeper mining did not really occur until later. By the 17th century mining was already well established in the area, although drainage was always a major problem. Initially the solution was to install several waterwheels to drive pumping machinery, but as the mine workings became ever deeper the need for better drainage became more acute. The Clive Shaft was sunk between 1842-45 and was originally equipped with a hydraulic pumping engine. This was installed in a stone-lined underground engine house. This was later replaced by a steam engine with a massive 100 inch cylinder and 10ft stroke, housed in a new stone-built engine house constructed on the surface next to the shaft. The adjacent boiler house contained seven boilers, which also powered a horizontal steam engine, used for the capstan and winding at the nearby Drawing Shaft. The engine house remained in operation until the Talargoch Mine closed in 1884. The engine house itself is the only structure still standing on the site and is the last surviving example of a Cornish style engine house in North Wales. 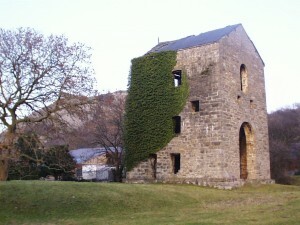 The engine house is surrounded by the remains of other structures and mine workings and represents an important relict mining landscape which evolved during the 18th and 19th centuries. The archaeological surveys have identified the main structures associated with the engine house, including the boiler house, flue, chimney, drainage culvert and bob-pit, as well as revealing other mine workings and structures. Some of these were contemporary with the engine house, such as the base of the steam engine winding at the Drawing Shaft, while others, such as a whim circle and numerous shafts, are likely to belong to earlier phases of activity. A VILLAGE’s mining heritage has become a gateway landmark. Meliden has a history of lead mining and at one time hundreds of miners worked in the village. The village is also near the last deep mine pit in North Wales at Point of Ayr, and Meliden Residents’ Action Group wanted to do something to acknowledge the importance of these industries. 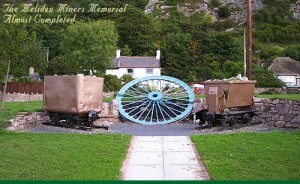 Now a pit wheel and mining carts have been set at the entrance to the village in the first phase of the group’s heritage project for Meliden. Denbighshire Countryside Warden Gary Davies and local artist and blacksmith Richard Jones, who is based at Dyserth Industrial Estate, have been working on the project, along with local painter and decorator Gwyn Thomas, who has agreed to paint the artefacts free of charge now they are in place. Residents living near the gateway to the village will also be closely involved in the design of the site. The action group is now working with other residents interested in the history of the village on a number of other similar heritage projects, including local leaflets, a book, and interpretation boards explaining the history of the mining industry.